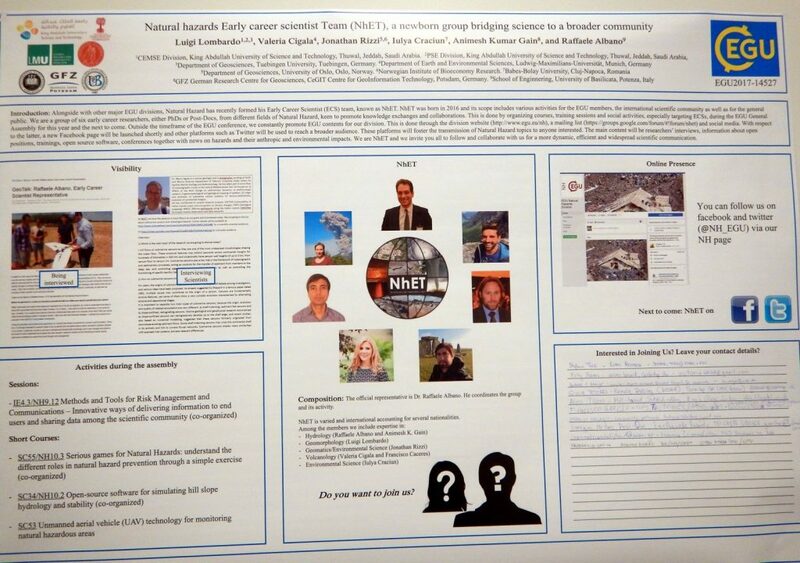 We used this poster to catch the attention of young scientists, interact with them and understand if they were interested in joining the network. More than 20 researchers left their contact details and were willing to actively join the Team. Credit: Valeria Cigala. If you were wondering what a group of young scientists such as NhET does in its free time, this is the right post for you to read! In between doing exciting fieldwork on an active volcano, writing an inspiring paper on landslide monitoring and applying that complicated algorithm for the analysis of earthquake return times: we organize events at the EGU’s General Assembly (GA) targeting Early Career Scientists’ (ECSs) interests. Can you believe it? Since the deadline for sending an abstract for the 2018 GA is getting closer (January 10), why not telling you a bit of what we did during EGU’s 2017 GA and try to make you believe. The risk of a Natural Hazard blog is now real, be prepared! Hello and welcome to the blog of the Natural Hazards division! Starting from today we will try to enrich your readings every two weeks on Monday morning with a new blog post! Our division encompasses and intersects various topics in geoscience. For this reason, we will aim to diversify the content from post to post, each time focusing on a different aspect of the complex natural hazard world. We have structured our blog to feature either the Interview of the month or the Paper of the month. The former will give you the chance to dive into the perspectives of both young and established scientists regarding research activities and state of the art applications for managing/understanding natural hazards. The latter will be a review of important articles that have significantly contributed to the hazard science. Due to the wide breath of the division, we will balance the posts to keep the scientific content and make it clear to a wide readership. Updates regarding natural hazard activities for ECSs (technical trainings, courses, summer schools and much more) will also be posted on a regular basis giving you the chance to stay up to date with our division. Similarly, we aim at giving you the chance to check job offers and career opportunity though our page. If you would like to receive a notification whenever we post something new, feel free to “Subscribe to blog” us by adding your email clicking on the right. Once again, welcome to our blog and we hope you enjoy readings! The Natural Hazards Early Career Scientist Team (NhET).